The weekend is back again, and that means another ‘Time Out’. This week’s questions are answered by Gill Phillips, Senior HR consultant at LoatesHR, Derby, who loves some 90s Britpop. I am usually the last person to leave on Friday because we are open until 6.30pm. I go home stick my jeans on and debate with my husband who’s cooking tea and who is going to take our youngest, who is 13, to youth club. Usually because the kids have access to remote control, the choice on TV tends to be Big Bang Theory. I am a soprano in Kilburn Community Choir – we sang at the Smalley Flower Festival and will be at pubs and clubs around Kilburn and the local area at Christmastime. We tend to sing songs from 60s, 70s, 80s. I also like singing the musicals like Les Mis as well as Adele and Emilie Sande. I can play the piano too. 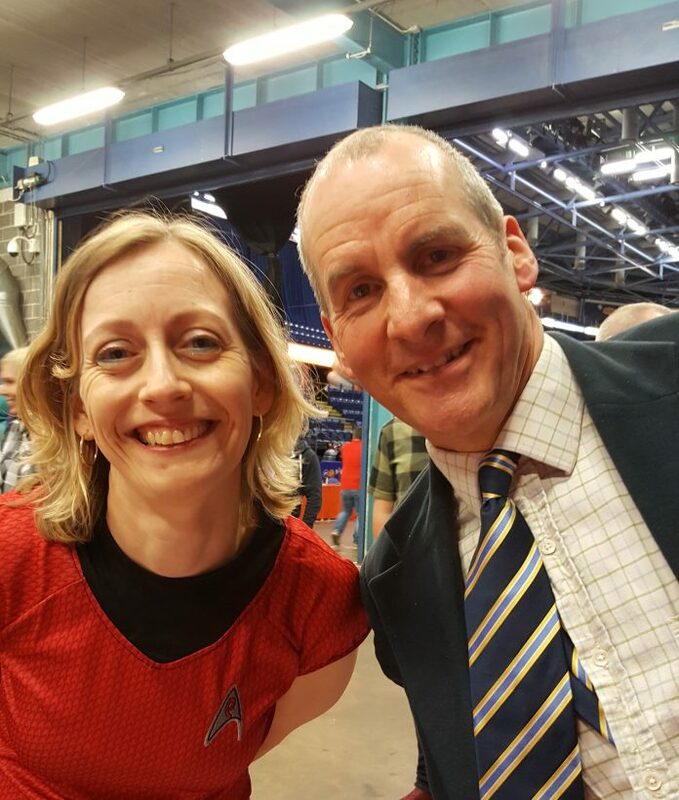 My kids are into sci-fi, so I go along to festivals and I got to meet Chris Barrie at East Midlands comic-con last year while dressed as Lieutenant Uhuru (pictured). Lord of the Rings – either the first or the third. The second one wandered too much into the marshes. Working on an oil rig – that’s what you do with a geophysics degree. We watch all the Marvel films so we have discussed this a lot and mine would be to be able to detect when people are not telling the truth. What is your favourite genre of music, artist or song? 90s Britpop – Pulp and Common People – I would play that over and over again. In the 90s I shared a flat in Manchester where Factory Records started out – it had the original leather sofas! It now has a blue plaque outside it. Landlord was Alan Erasmus. I would love to be somewhere like Austria in the 18th century and see the music of Mozart live.